The strategy board game Chess has been around for many years with the first mention of the game occurring around 600 AD. Today it is one of the most recognized and popular board games available. Chess is played by two people and consists of a square chequered board with eight rows and eight columns (64 squares in all). These squares are usually coloured black and white alternately. Each player plays either black or white pieces, each set numbering 16 and consisting of a king, queen, two bishops, two rooks, two knights and eight pawns. The aim of the game is to reach checkmate where you have trapped the other players King. Setting up the board is a matter of deciding who goes white or black. Players then place the pieces on the closest row to each player in the following order left to right: rook, knight, bishop, queen, king, bishop, knight, rook. The row in front of this one has a pawn placed in each square. Note however, each players queen piece must be situated on its own colour (i.e. the black queen on the black square and vice versa). Once the board is set up it’s time to begin with white always making the first move. Piece movement in chess is wholly dependent on the piece. Pieces will generally move to an empty space, or a space occupied by the opponent’s piece, when this occurs the opponent’s piece is removed from play. The pawn moves forward, one or two spaces, but they cannot move backwards. This restriction makes them the weakest pieces in play, however a pawn can be changed to any other piece (other than a king) if it makes it safely to the opposing side of the game board (the very last row). Rooks or ‘castles’ as they are sometimes called can only move in a straight line, any direction other than diagonal and however many squares the player wishes, provided it is unobstructed. Knights move in ‘L’ formations any way, provided it retains the 3 up 2 across or 2 up 3 across formation, it can also leap pieces. Bishops are similar to rooks, however as a rook can only move straight lines ahead, side or behind, the bishop can only move any direction diagonally. The queen is the most powerful playing piece on the board, she can move in any direction straight or diagonally. Players succeeding in getting a pawn to the opposing last row will often change their pawn to a queen for this reason. The king is the most powerful piece in play in the sense that when the king is cornered with nowhere to move it is the end of the game. Movement wise however, the king can only move in increments of one space at a time, in any direction. This is so the king can manoeuvre its way out of being in ‘check’. 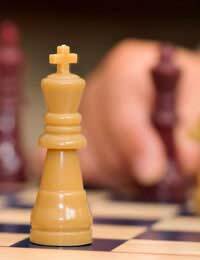 Check occurs when a player’s king is under attack by opposing pieces or piece. Generally the player under attack will move the king it’s allows one move out of harms way, or take the piece attacking with another piece. Checkmate however is when the king is unable to move anywhere safely, it is essentially surrounded by opposing pieces wherein no matter what square it moves to it can be taken by the opposing player, thus resulting in the end of the game. There is no scoring in Chess as such, unless those playing it play up to a certain number of games (example best of 5). Winning chess comes down to strategy and tactics, with the player using these to the best advantage over their opponent. It is very much a thinking game where planning ahead and looking at possible moves a few stages in front of the one you’re currently playing will ultimately win you the game. The popularity of Chess means the variants in pieces and boards is extraordinary, though generally the playing grid remains the same. Movie and TV tie-in sets flood the market, with the original bland playing pieces replaced by film or TV characters, from The Lord of the Rings to The Simpson’s and Star Trek. Over two thousand known chess variants exist, some with unusual playing boards, even multi level playing surfaces. The Castling move is a variant that some players use and others do not. Castling involves two pieces, the rook and king. Both pieces must be on the same squares they started on without having moved. These are then moved until they are side by side. The king is only ever moved two squares left or right, with the nearest rook overstepping the king and finishing on the adjacent square. There are numerous strategies for playing chess, but many are separated dependent on the piece in question. To this end, there is the rook strategy, knight strategy, bishop strategy and pawn strategy. Rook strategy - In rook strategy, the basic aim is to try to move your rook to an open file, this means the pawns can't block the rook from moving forward. The reason that a rook should be placed on an open file is that they can then control a lot of movement in the centre and furthest away points on the board. If you have the chance to put both your rooks on open files then you should do so. Knight strategy - The most important move for the knight is getting it towards the centre of the board. This way it has control over 8 squares whereas on the side of the board it has control of only 4 squares. You must never leave your knights on the edges or the corner of the board as this lowers your chances of controlling the board. Bishop Strategy - With the bishop it is important not to fix pawns on the same colour as them. Bishops can dominate knights on an open board, so therefore it's better to ensure they can move freely as otherwise they can become fairly redundant on the board. Pawn Strategy - Try to keep your pawns in a good tight structure during play. They are the foundation of a good attack and any holes in your defence will be exploited by your opponent. Try not to double up pawns, and try to get them as near to the queening square as possible. They become more powerful as they stay in the game.